In just 10 days, voters will go to the polls and deal with the rather distasteful choice of Donald Trump and Hillary Clinton. In some states, they also will have an opportunity to vote for or against various ballot initiatives and referendums. Here are the five proposals that would do the most damage in my humble opinion. ColoradoCare (Amendment #69) – Apparently learning nothing from what happened in Vermont, advocates of big government in Colorado have a proposal to impose a 10 percent payroll tax to finance statewide government-run healthcare. The Tax Foundation points out that, if this scheme is approved, Colorado’s score in the State Business Tax Climate index “would plummet from 16th overall to 34th,” while the Wall Street Journal opines that “California would look like the Cayman Islands by tax comparison” if Colorado voters say yes. Oklahoma Sales Tax Increase (Question #779) – Sales taxes don’t do as much damage, per dollar raised, as income taxes, but it’s still a foolish idea to impose a big tax hike in order to finance bigger government. And that’s what will happen if voters in the state agree to boost the state sales tax by one-percentage point. The Tax Foundation notes that “Question 779 would give the Sooner State the second highest combined state and local sales tax rate in the nation, after only Louisiana. California Tax-Hike Extension (Proposition #55) – One of worst ballot initiatives in 2012 was California’s Proposition 30, which imposed a big, class-warfare tax hike on upper-income residents and gave the Golden State the nation’s highest income tax rate. One of the arguments in favor of Prop 30 was that the tax increase was only temporary, lasting until the end of 2018. Well, as Milton Friedman famously observed, there’s nothing so permanent as a temporary government program. And that apparently applies to “temporary” taxes as well. Proposition #55 would extend the tax until 2030. Unfortunately, there aren’t a lot of ballot initiatives that would move policy in the right direction. Here’s the one that probably matters most. A related measure is Amendment #1 in Georgia. Now let’s shift to a ballot initiative that is noteworthy, though I confess I don’t have a very strong opinion about the ideal outcome. Washington Revenue-Neutral Carbon Tax (Initiative #732) – The bad news is that a carbon tax would be imposed. This means, according to the Tax Foundation, that the “average household would pay $225 more per year for gasoline under the proposal, and $64 more for electricity.” The good news is that the sales tax would drop by one cent and the state’s gross receipts tax would almost disappear. So is this a good deal? Part of me says no because it’s never a good idea to give politicians a new source of tax revenue. But the fact that the measure is opposed by many hard-left green groups suggests that the idea probably has some merit. For what it’s worth, I would vote against I-732 because of concerns that it eventually will lead to a net increase in the burden of government. Last but not least, I’ll also be following the results on initiatives dealing with marijuana and tobacco. States Voting for Marijuana Legalization (and Taxation) – Voters in Arizona, California, Maine, Massachusetts, and Nevada will have an opportunity to fully or partly legalize marijuana. These initiatives also include buzz-kill provisions to levy hefty taxes on producers and consumers. States Voting for Tobacco Tax Increases – Politicians in California, Colorado, Missouri, and North Dakota all hope that voters will approve tax hikes that target smokers (and, in some cases, vapers). In every case, the tax hikes will fund bigger government. P.S. 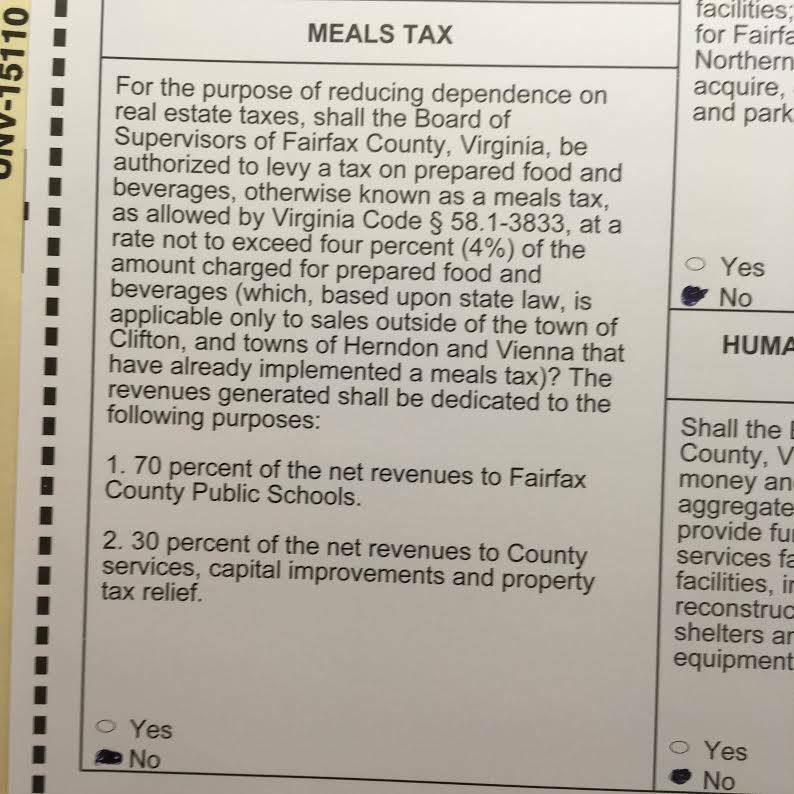 I can’t resist adding that I’m also keeping my fingers crossed that other voters in Fairfax County will join me in rejecting a scheme to add a 4 percent tax on restaurant meals. Not just because it’s a tax hike to fund bigger government, but also because the hacks in the county government are using dishonest and reprehensible arguments to push the tax. P.P.S. I will be updating my prediction for the presidential election, and also making predictions for the House and Senate, the morning of November 8. The ballot initiative in Georgia is not about charter schools (they just put that in there to fool people). It’s for the state to take total control of failing schools and run them without any input from the community and or parents. It’s being pushed by the governor, Deal, and he and his cronies are getting kickbacks from it. It will be voted down. I am voting against 69 in Colorado, but a evil, nasty part of me hopes it passes. Because if it does, I have a laundry list of minor medical issues that need attention, and I plan to PERSONALLY bankrupt the state. Please do not superimpose graphs and text. This is a recent development, and makes some interesting stuff impossible to read. Many of these initiatives are intentionally misleadingly labeled and described. The CA 55 one the author opposes, for example is titled “TAX EXTENSION TO FUND EDUCATION AND HEALTHCARE INITIATIVE CONSTITUTIONAL AMENDMENT.” The simplifying assumption I’ve found helpful is, if you don’t understand it, vote “No.” That’s based on hours of study of all 17 proposals in CA this year, and determining that only 3 are for sure worthy of support: 53, 54 and 66.) Personally, I favor 64 also (MARIJUANA LEGALIZATION INITIATIVE STATUTE), as I have long considered the drug war as lost a cause as Prohibition, and for the same reason – you can’t permanently outlaw anything a significant minority of the population insists on using anyway. Re the OK sales tax for education – it is being sold as giving the K-12 teachers a $5,000 pay raise, but less than 70% goes to those schools. The next highest % is for the university system which does not explain how they would use the money. Most people I know are voting NO. Other interesting issues are “right to farm” which seems to give more power to the corporate farm than the family farm and shuts down the legislature’s ability to pass laws concerning farming issues. Exactly. What better proof of the coming decline. Silicon Valley is 75% solidly Democratic and another 20% is for some other form of big government. (That leaves the remaining 5% to form an alliance with country bumpkins who haven’t quite figured out what freedom is, but believe in it anyway, and — most importantly — could turn the other way in a jiffy). In other words: The smartest people in America want to Europeanize. Don’t they understand what a one percent trendline growth — in a world that is trendlining an irreversible three to four percent — means? Don’t their brains understand how quickly such a growth deficit compounds? Apparently they never will. I’m sure many have created narratives about how government that grows to spending and controlling half of GDP will somehow lead to more growth. Not one welfare state in Europe can do it, but we will! Others are willing to take the Faustian deal of a few more years favorable politics in exchange for long term decline — which will somehow be avoided later — “we’ll think of something — and pass it by three hundred million voter-lemmings”. Good luck. The politician self-aggrandizing policies are not a conspiracy. Save a few very-very intelligent politicians who are competent enough to lead a somewhat double life — often in real time (and Clinton may be one of them), the rest do truly believe in the beneficial role of big government. The rest, the small government politicians (i.e. the suicidal politicians) the people themselves quickly eliminate early in the electoral process. In other words, the people themselves ferret out big government aggrandizing politicians and promote them to high office. Naturally, these politicians then choose and support a mandatory collectivist education which — surprise — prepares voters to exercise their coercive collectivism power. The vicious cycle closes on many fronts. When you hear the cry “Power to the People”, in most cases, run! Run because what is being talked is not taking power from someone else who currently holds it, and give it to “The People”. It typically means create new powers, currently non existing, and give them to the people, to the majority, their representatives and their committees, to control your life — and ultimately suppress your motivation to produce, turning you into a structurally slow growth nation. In the end, that is all that matters. The vortex of low growth eventually swallows everything. Prosperity rankings, culture, tradition, hope, change, they all go down. You become a once great culture, now forgotten in a museum, languishing as the middle income nation of a future fantastical world. But let’s forget about all that, let’s just say each other a few nice words, lets all turn and hug the person next to us, let’s all sing Kumbaya, let’s all gather under the flag and march as one nation, let’s just go to work tomorrow and every day after and work 8-12 for our families and 12-5 for distant unknowns. You know, that is how we teally think when we go home. Just believe in it enough and it will become true. Enthusiasm in solidarity, enthusiasm in producing for distant unknowns, IS sustainable. No one, no other nation, will outcompete us. While your comment is depressing, it is probably accurate. The politics of power pushes our “leaders” and “teachers” to promote dependence, the exact opposite of the correct prescription. Contrary to normal assumption that the bottom 51% will out vote the top 49%, I was watching a Milton Friedman video on “Director’s Law”, which states that the middle 51% will out vote the very top and very bottom. It is an educated middle class that keeps voting for policies that they believe will enrich themselves. This is depressing because it means an educated middle is doing this to themselves. On the other hand, an educated middle has a better chance of understanding their mistake than the uneducated poor. Our problem is that this “educated” middle has been educated by flat out socialists acting as teachers. Our political leaders then use that mal-education to promote self-aggrandizing policies. Any initiatives to decrease taxes? Anyone think the voter-lemming will wise up and reverse the trend? Suddenly vomit up a decade of enthusiastic HopNChange? 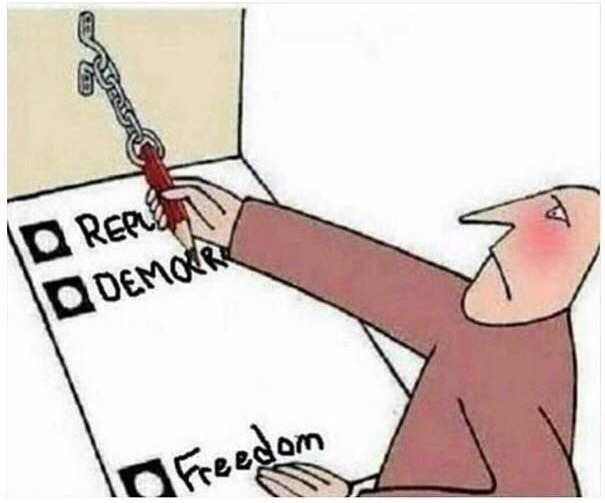 I warned back in 2008 about that particular election being the last exit to freedom on the highway to serfdom and economic decline — and that voter-lemmings reacting to problems (the financial crisis) created by coercive collectivism with even more statism, demarcated definitive entry into the standard vicious cycle of decline. Love, leftism, songs, banners, hope, change, and all that typically accompanies such apparently sophisticated naiveté. What will the 2020 election bring? A Putin Sanders choice? You’d think the voters of a country where structural growth has already dropped to a new accepted normal of just half the world average growth would be wiser. You’d think they understand the simple arithmetic fact whereby their country became most prosperous by achieving and maintaining a growth rate higher than the world average for most of their history. Don’t expect things to get better. Data points from all over the world indicate that they will never understand. The better educated European voters have had structural economic growth rates down to a quarter the world average (for a quarter century now) and still have not understood the simple exponents of growth and decline. These voters still vote for ever higher taxes (directly or indirectly). Americans are — and will — follow right in their footsteps. Bernie Sanders’ dream will become reality — even if he’s not elected. It will just take twenty percent longer to complete. Americans are careening straight into the middle income countries of this world by the latter part of this century — there simply isn’t another arithmetic. As a still free (and wiser since you read this blog) person — act accordingly. And prepare your salvage boat. Once all the other voter-lemmings start hearing the vortex noise of the drain they’ve been circling — it will be too late. The exit chutes will be jammed. Now is the time to make exit plans. Now while they’re still rejoicing on the Hopeful road to Change. Change into a quarter average world growth economy. Change into decline. Even many smart people I see, CEOs, executives, scientists, engineers, Ivy League graduates etc. are oblivious to the fact that the America that is coming is not the America they know. Many are detecting a vague foul smell in the air but can’t tell what it is. As they say, decline and crisis builds slowly, but tends to manifest itself suddenly. Once the tipping point is reached –and passed — decline comes quickly. The rest of the world has neither the patience nor the desire to see how the American voter lemming’s turn toward coercive collectivism turns out. America is — and will quickly be — left in the dust. The once relatively prosperous twentieth century American will languish in the relative malaise of a middle income country by the latter part of this twenty first century. The way today’s Argentines must feel in today’s world. In the immediate future Americans will differentiate between those who realize that this transformation is happening — and take appropriate preemptive action — and those who don’t, those who think that a vote for HopNChange will bring better days — which ironically includes most of Silicon Valley. The naïveté is almost entertaining I must say! P.S. As far as the state rankings,… if every state eventually raises taxes, the rankings will stay the same. So all will be fine. Voters can sleep happy. The slumber of decline. But unlike past generations, the effects of today’s choices will come quicker, much quicker. Everything human is irreversibly moving faster — and accelerating — as the century moves along. Gone are the days when voter-lemmings could pass the effects of their bad choices onto their children. Going forward the effects of bad choices will hit most of the very same voters that enacted them — later on in their very own lives. We are headed into interesting times as everything has irreversibly accelerated — and continues to accelerate even further as humanity barrels down the twenty first century. Nation ascents and declines that used to take centuries are now poised to conclude in decades — and accelerating!! While as a Massachusetts resident, I support #2 on charter schools, many existing charter schools have been staffed with the same administrative hacks found in the public schools. As long as government is the one actually funding charter schools, this will continue. If on the other hand vouchers are presented to parents, so they are the ones choosing administrators and teachers, improvement would be rapid. The competition is heated in the race to the bottom of the “Business Tax” list. I noted from the ballot picture that you, like myself, select “no” in most all ballot initiatives. Unless its to remove something from government, I’ve discovered that most mean bad things. The exception to the no vote is when they craftily word something to make you think that a no vote is against giving them more money. I used to live in Colorado. It seems Colorado is going the way of the welfare hippie state. Must be the thin air- what do you think? The interesting thing about the pot laws are that the working people there still cannot partake because their jobs normally dictate that they can be asked to take a random drug test at any time, and fired if it is found in their blood stream. So, the only ones allowed to smoke are those derelicts who used to do it anyway, or bankers and the likes who never suffer random urinalysis. Add free healthcare on top of that, and other than the snow that hits, it seems all you need is a sleeping bag, and you too can take up residence on the Boulder Mall. Just glancing through howardat58’s blog, I can tell he doesn’t even know what mathematics is, as based on his idea that anything with high-school algebra as a prerequisite is “higher” math. So, you can safely ignore his idea that “Massachusets [sic] no. 2 is rubbish”. Massachusets no. 2 is rubbish. Get real.